Way back in 2007 I posted a Chocolate Chunk Cookie with Oreos in it. A lot of bakers were stuffing Oreo chunks into cookies back then, and one of the recipes being used as “base” was from the Nielsen-Massey recipe collection. Out of all the Oreo and chocolate chip madness came this Oreo Chocolate Chunk Cookie. I thought I’d mention this because people people appreciated the link posted earlier to the Odense Almond Paste recipe collection, and like Odense, I think the little collection on Nielsen Massey’s site is often overlooked. So check it out! 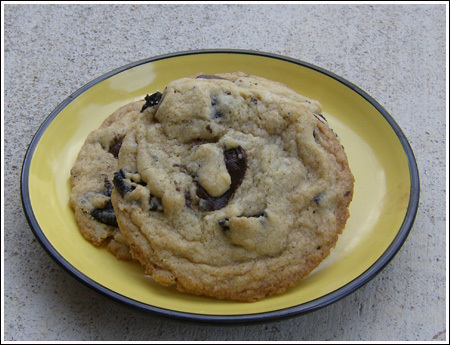 Nielsen Massey’s chocolate chip cookie recipe is a good one, with lots of ridges and folds. It’s not particularly buttery, but that makes it a good vehicle for carrying chunks of other things. They also have a really simple, Crisp Butter Cookie (which I might try today), and they have a recipe for French Macaroons, for those of you who like making them from scratch. But back to the Oreo chunk cookie, here it is again traveling to the future from 2007! Heat oven to 350 degrees F. Beat butter and sugars until smooth. Add vanilla and eggs and mix until combined. In a separate bowl, stir together flour, soda, salt, baking powder and cream of tartar. Add flour mixture to butter mixture and stir until incorporated. Stir in oreos by hand. Gina, I hope you like it! BTW, sorry this post was so late. I thought I’d published it, but I was alerted that the feed wasn’t working. I feel like I should be baking a batch of gluten free oreos just so I can bake these. They look so good. Imagine…a double cookie milkshake! phwoarrr. I love anything with oreos in! I just bought a load of them as well… coincidence? I think not. I love your blog by the way! It has helped me through many a miserable work day for a couple of years now! My aunt & I are going to visit Austin in early Oct. Do you have any suggestions for economical hotels & which part of town to stay in – N, S, E, W? Also restaurant recommendations please. yum! there is a place in Georgetown, DC called Wisemillers that sells these, delicious! This is an interesting recipe with baking soda, baking powder AND cream of tartar! Also interesting that it isn’t as buttery as some other recipes. I too would be afraid of having an entire pack of Oreos around as they are one of the few store shelf cookies I love. (I love Golden Oreos too.) I would probably just buy one of those little packages of Oreo bites to bake with. That way I wouldn’t have the home made cookies and the leftover Oreos looking at me. Oreos make everything better – I need to try these! Oh my goodness. I have a weakness for anything with Oreo’s…. Looks like a fun cookie to eat-you get an Oreo surprise! Only problem is you have a lot of Oreos left over calling your name!!! This is a good looking cookie. I’m not much for Oreos but I can see this as a good base for other goodies, especially of a chocolate nature.